For some reason (probably because I am an incurable over-packer), I am always in search of the perfect travel-sized, all-in-one palette. I like the idea of being able to toss one or two palettes into my bag and having everything I might need for a long weekend away. These palettes fit the bill! 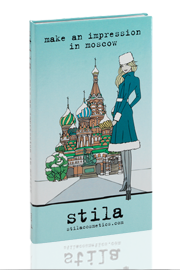 As a long-time fan of Stila, I am so excited that they are offering these "limited edition" low-priced set of travel palettes. I mean, $10 each...what a bargain for Stila! These palettes each contain 4 shadows and 1 convertible color (blush and/or cheek color). 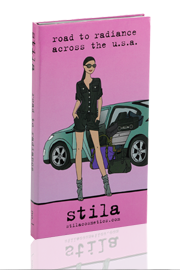 Typically the Stila shadows run at $18 each for a single plan and $25 for a convertible color single. Hopefully this is a sign that there will be more economically priced options from Stila in the future. I picked up these cute palettes at my local Ulta, but they are also available on the Stila website. I purchased both the "road to radiance: across the USA" and the "trendsetting in Tokyo" palettes. I passed on the "pretty in Paris" (just because I have a convertible color in that shade already). I believe that Stila is releasing one new one per month or season? The newest one..."make an impression in Moscow" looks beautiful (bronzy neutral shadows plus a pretty sky blue shadow and a peachy-pink convertible color)! Its available already on the Stila website and I will likely pick that up at Ulta next time I am over there. 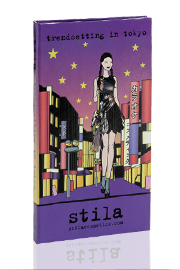 These palettes are fashioned in the typical Stila cardboard style with cute graphics and colors listed on the back. The inside is black and contains a mirror and a convertible color and 4 (small) eye shadows. If you are not familiar with Stila's convertible colors: they are a cream based product that doubles as a lipstick and a cream blush. So, you literally have everything that you need for color cosmetics for your face. FYI: I included swatches on my hand (and I apologize for the poor photo quality!). Road to radiance is on the top and Trendsetting in Tokyo is on the bottom. I swatched the CC's first and then the shadows in the darkest to lightest in range. The Road to Radiance is more of a day palette with neutral shadows and an eyeliner color and a more neutral convertible color. The e/s colors are: Snow Bunny (shimmery champagne/taupe, shimmery valley girl (pinkish taupe), southern belle (shimmery medium pink), and city chick (a beautiful very pigmented dimensional purplish taupe-bronze...the best of the palette). The CC is Hibiscus. This palette is worth it for the city chic shadow and Hibiscus alone! Hibiscus applies as a beautiful pink with a plumish undertone. This is a great natural palette for everyday for work or school. Shadows apply pretty sheer but are build-able. City Chick is very pigmented but blends beautifully. Great palette! I have been wearing this for work/school very frequently! If you want some drama, like evening looks or experimenting with color...go for the Tokyo palette. I was drawn to the beautiful hot pink of the convertible color in this palette (Sakura)...it is beautiful on the lips. The eye shadows are vibrant and fun. The eyeshadow shares are: sake (gorgeous shimmery gold), kawai (a beautiful shimmery rose pink), shibuya (a deep matte midnight blue), and peace (a shimmery deep black). I love using sake all over the lid with shibuya on the outer lid/corner and lined with peace. Beautiful! Hope you enjoyed this review!